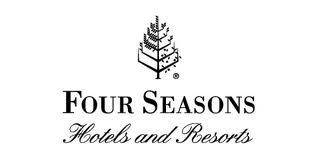 Over the years we have made a variety of custom furniture pieces for many 5-star luxury hotels including Four Seasons, Mandarin-Oriental, Ritz-Carlton and Umstead Hotel and Spa. Typically the pieces we make are either the specialty pieces that get showcased in public areas, or custom furnishings that go into the restaurants, cocktail lounges and the most luxurious of penthouse suites. Today we completed a custom Audio/Video Cabinet that will soon be delivered to the Presidential Suite of a newly renovated Four Seasons Hotel. 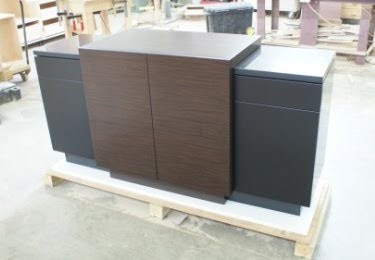 This cabinet was custom made out of a combination of FSC certified Ebony veneer, and satin black lacquered panels. 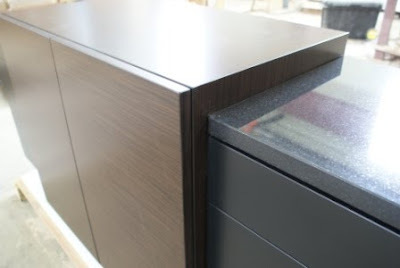 The tops on each of the end cabinets are made of 1-1/4" thick Nero Assolute granite. 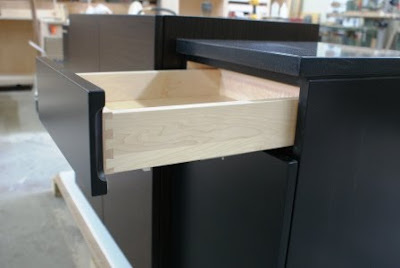 The drawers are dovetailed solid maple, running on concealed and self-closing Blumotion linear ball bearing slides. 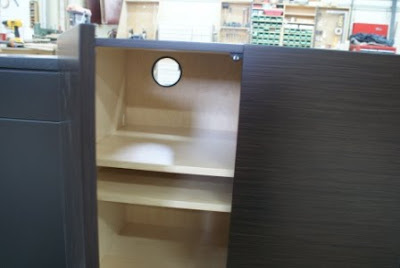 The cabinet interiors are finished in satin natural maple, and the inlaid grommet in the backs allow for wiring. 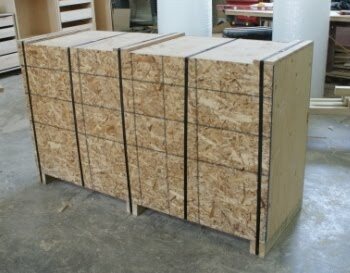 After final cleaning and inspection the cabinet is wrapped in tissue and bubble wrap, before being crated for shipping.